SSR performs a large proportion of the infrastructure train haulage in New South Wales, and the interstate rail corridor in Victoria. Our heavy haulage rail freight services offer customers expertise and quality assurance that each job is done properly while adhering to high standards for safety. Infrastructure rail services are typically operated in a ‘Hook and Pull’ arrangement, where most of the rollingstock is owned by the network manager, and SSR provides the locomotives, train crew, and all necessary train operating functions and management expertise. Experienced train crews are used to perform what can be quite specialised and exacting tasks in worksites. Apart from the ballast, sleeper, rail delivery trains and reclamation of ‘fouled ballast’ spoil trains, SSR also undertakes the heavy haulage of specialised infrastructure maintenance equipment worth many millions of dollars. This type of equipment includes ballast cleaners, track laying machines, tampers and specialised wagons loaded with track panels and associated machinery. SSR operates infrastructure trains for network owners and managers such as Sydney Trains / RailCorp, Australian Rail Track Corporation, and John Holland Rail. SSR has been involved in many major projects with these network managers and continues to provide heavy haulage services to assist with the upkeep of the networks across Australia. Where other rail freight companies provide stock and standard services, SSR is different. Our team goes beyond the call of duty to ensure that your requirements are met with an efficient and cost-effective solution. 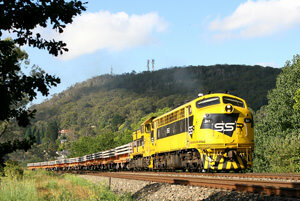 Get in touch with us today to discuss your requirements for rail freight services in Australia.